We make the extra effort to look good so you look good. You’ll never see snake pits of cords and cables, mismatched home components, milk crates, cheap lights, etc. We do not set up on tables and show no extra equipment. All our systems are identical. When you see us at one party, and would like that system for your event, be assured that is the system you’ll get. We invest approximately $15,000 dollars for each system that features lighting. Our equipment is pro-line gear, manufactured for road reliability, housed and protected in equipment racks of black plastic with aluminum frame and trim, engineered for performance and appearance. 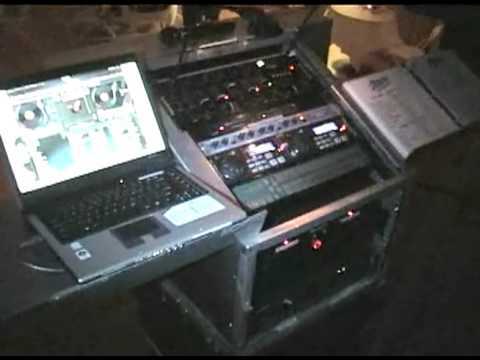 Our systems keep our company successfully on the road show after show, year after year. If you’re at a party with FANTASIA Sight & Sound, Inc., you’ll notice we have a more professional stage appearance than any other DJ service. Our overall appearance is first class! WITH FANTASIA YOU DON’T HAVE TO WORRY ABOUT IT! © Copyright Fantasia Sight & Sound, Inc. All Rights Reserved.